So a recent client had a question about adding video to their web site. Specifically, they needed to add video to ONLY their site. The video was for education and they needed to be able to put the video behind a registration and payment process. I’m sure you know just how valuable video is today and having the ability to control where your videos are shown is a very important part of the process. Please note: You need a responsive theme for this to work properly. Don’t have one? Check out the great responsive themes from StudioPress! The first step when adding video to your web site is to decide where your video should be hosted. Your first thought might be to upload the video to your web server. This might work well with small basic videos, but is really the last choice for your video. The next most likely choice is YouTube. An excellent option for hosting your video as long as you’re okay with people being able to view your video on YouTube. YouTube is the big boy in town and you can host high quality video on their site for free. Please realize that they might play ads along with your videos so if that’s a problem, YouTube may not be the best choice. If you’re looking for a little more control, there are paid hosting options from companies like Vimeo, Wistia, Brightcove and Viddler. There are a ton of paid video hosting options out there but the four listed are some of the more well known options. I prefer Vimeo. Great pricing, great platform, great support when needed. Vimeo has a free plan, and a couple of paid plans so you’ll want to compare them to find the one that’s right for your needs. Right now they are offering their PRO plan for just $139 a year. This is a savings of $60 off the regular price. Now that you’ve selected your video host, it’s time to upload your video. Just follow the instructions provided by your provider and you’re ready to go. 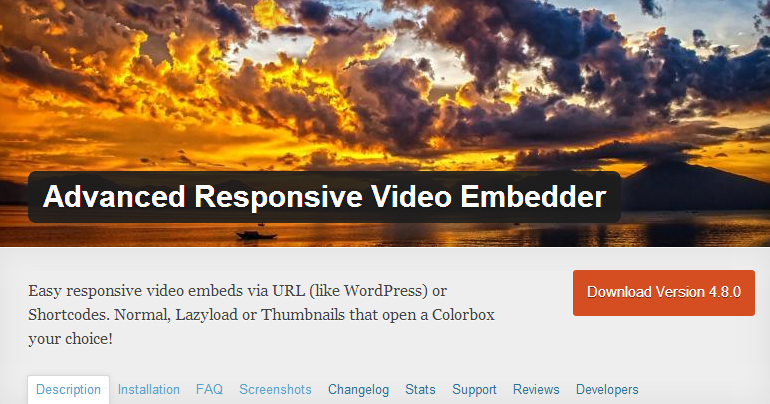 Simply go to Plugins > Add New in your WordPress web site and search for “Advanced Responsive Video Embedder”. Now you can simply click on the Embed Video button directly above your post editor. 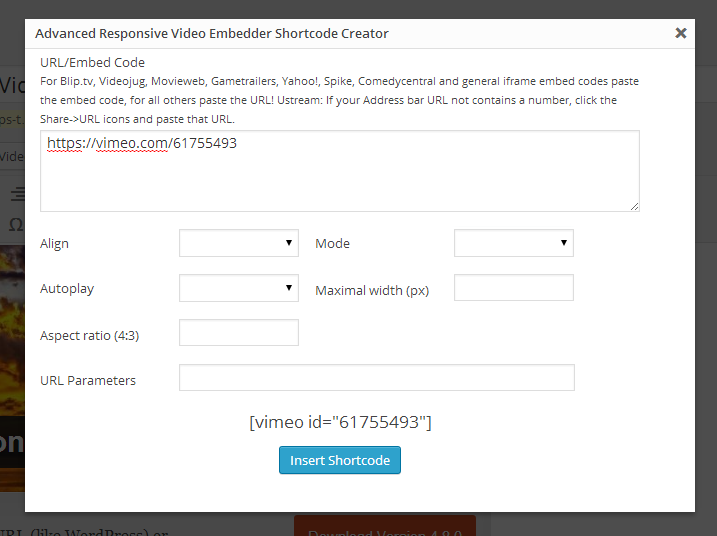 A new window will popup where you can add your video URL or embed code depending on the service you use. With Vimeo, just paste the URL of your video and then select your options. Hit the insert shortcode button and you’re all set. That’s it. Feel free to play around with your screen size to test the embed on your device. Do you need to secure your video and only show it on your site. 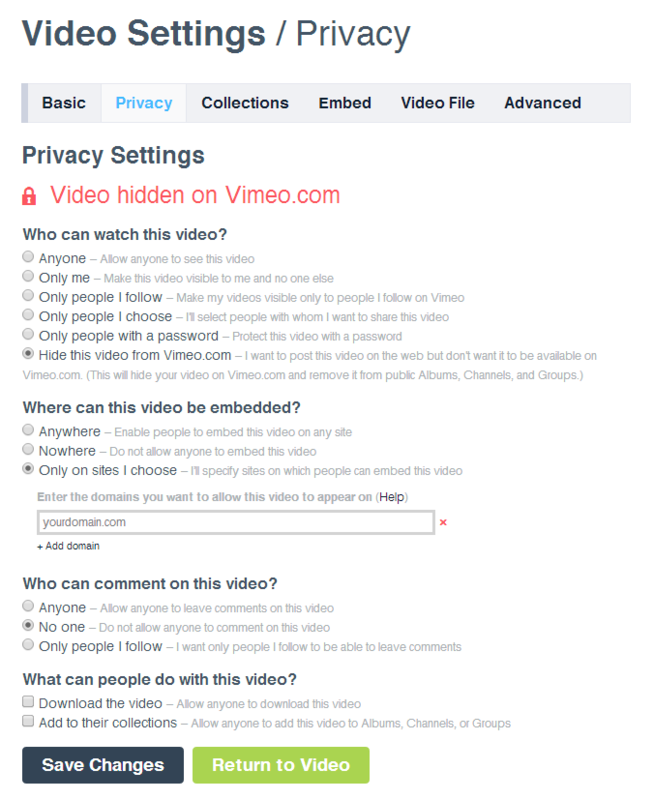 Vimeo Plus or Pro both offer you the ability to hide your video on Vimeo and select where your video can be embedded. Simply go to your Video then Settings > Privacy and make the adjustments as needed. game extended and so have suggestions to generally share.